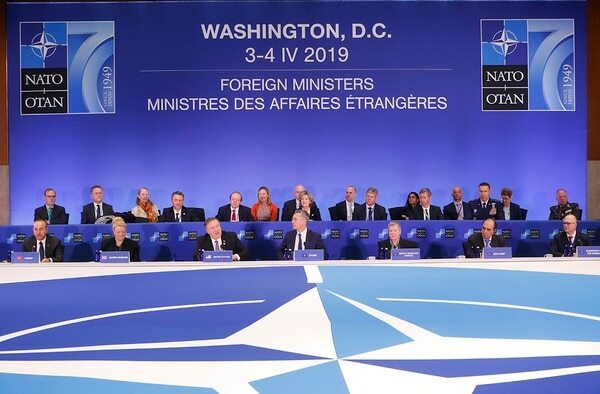 WASHINGTON — NATO foreign ministers approved a series of measures Thursday aimed at countering Russia in the Black Sea region, an agreement that comes amid public rifts between the United States and several of the other 28 members on security and trade issues. 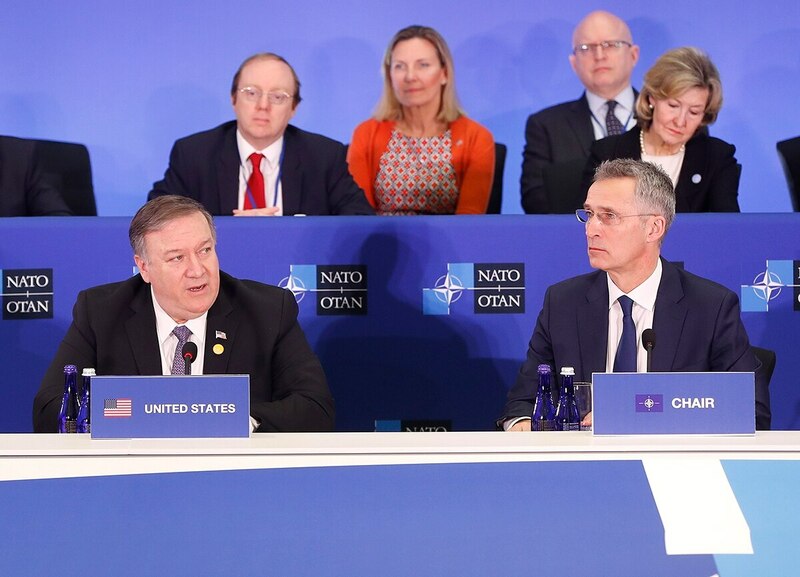 In a meeting in Washington to mark the 70th anniversary of NATO, the ministers agreed to provide Georgia and Ukraine with increased maritime cooperation, patrols and port visits. Both countries have faced Russian aggression and have aspirations to join the alliance. The NATO ministers also renewed demands for Russia to end its annexation of Crimea, release Ukrainian sailors and ships it seized in a confrontation last year in the Sea of Azov and respect the Intermediate-Range Nuclear Forces Treaty. The U.S. announced it will withdraw from the 1987 treaty in August unless Russia returns to compliance. But a deepening dispute between the U.S. and Turkey over the Turks' planned purchase of a Russian air defense system, U.S. demands for allies, particularly Germany, to boost defense spending, and a row with Canada over tariffs hung over the commemoration ceremony at the State Department. NATO Secretary-General Jens Stoltenberg used an unprecedented address to Congress on Wednesday to acknowledge strains in the pact and to pressure Russia to return to compliance with the Intermediate Nuclear Forces Treaty. Secretary of State Mike Pompeo appealed for the allies to stand together to confront "great power" challenges from Russia, China and Iran. He hailed NATO's deterrence of the Soviet Union during the Cold War and said the alliance was well positioned to move forward as it confronts new and evolving challenges. "We have rightly sought peace through strength here at NATO," Pompeo said. "We must continue to do so, especially in this new era of great power competition from Russia, from China, and the Islamic Republic of Iran." Addressing those challenges and others such as terrorism, cybercrime, uncontrolled migration, threats to energy security and new technologies will require enhanced resources, he said. He also renewed a warning that the U.S. might have to curtail intelligence cooperation with countries that rely on Chinese communications technology. Pompeo said every NATO member had an obligation to explain to its citizens the need to increase their defense budgets and rejected what he called "tired excuses" about public opposition to such spending. "We're very hopeful that they will get it right, that they will understand that it is important for our collective defense," he told reporters later, referring specifically to Germany. NATO Secretary-General Jens Stoltenberg, in an address to Congress on Wednesday and again on Thursday, acknowledged serious divisions within the alliance and called for bigger defense budgets. President Donald Trump has questioned the value of the alliance and criticized some members for not spending enough on defense. Pompeo did not address the spat with Turkey in his remarks, but in a Wednesday meeting with Turkish Foreign Minister Mevlut Cavusoglu he had made clear Washington's displeasure with Ankara for insisting it would go ahead with plans to buy Russia's advanced S-400 system instead of the American Patriot system. In a sign of rising tensions between the two capitals, Turkey's foreign ministry disputed the State Department's account of the meeting, which said Pompeo had warned of "potentially devastating consequences" of unilateral Turkish military action in northern Syria as well as consequences for buying the S-400. The ministry said the account failed to accurately reflect the content of the discussion and added that "our alliance naturally requires that such statements are prepared with greater care." Asked about the Turkish complaint, Pompeo said he had re-read the account and it was "spot on." ''I stand by every word of it," he said, adding that his meeting with Cavusoglu had been "good" and "long" and that the Turks were well aware of the U.S. position. The Trump administration is threatening to stop delivery to Turkey of the newest U.S. fighter jet, the F-35, if the S-400 purchase is completed. Vice President Mike Pence had delivered the same warning, noting that the U.S. and other NATO members had grave concerns about the S-400 as it is not interoperable with alliance systems. "Turkey must choose," Pence said Wednesday. "Does it want to remain a critical partner in the most successful military alliance in the history of the world or does it want to risk the security of that partnership by making reckless decisions that undermine our alliance?" Cavusoglu and other Turkish officials say they are proceeding with the deal because the need is urgent and the Patriots could not be delivered for another decade. They have also said the S-400 is not intended to work with NATO systems and will be a purely stand-alone defensive mechanism. Stoltenberg acknowledged that the matter was a point of severe contention between the U.S. and Turkey and expressed hope that a resolution was possible. "We fully realize that this is now a challenge," he said. Meanwhile, Canada's Foreign Minister Chrystia Freeland took the opportunity of the NATO meeting to register Ottawa's displeasure with being labeled a potential national security threat by the U.S. in relation to steel production. She called the designation, which has led to the imposition of tariffs on Canadian steel, "absurd" and pointed to her presence at the NATO meeting as proof that Canada is not a threat to the U.S.
“We really think this is groundless,” she told reporters.